Why This Costume: Space Cadet Cosplay and I have talked about making Sailor Uranus and Neptune since before either of us joined Cosmic Coterie. Late last year, our teammate Victoria Bane mentioned she wanted to make a new Sailor Pluto, then AdventTraitor mentioned she wanted to make a Sailor Saturn, so we kind of stumbled our way into a full outer senshi group! Matte Casa Satin in Eclipse from Jo-Ann’s. I ran out of Telio satin when I got to my collar, so I found a close substitute! Sailor Moon Fuku Patterns by Cosmic Coterie (bow pattern pieces inspired by Sparkle Pipsi). Note: I primarily used the plus-size leotard pattern I drafted a few months ago for commissions, and I swear I’ll get around to digitizing it soon! I’ve made about a billion fukus at this point, so I’m not going to go crazy in-depth on this post other than to comment on a few special tweaks and challenges I encountered with this build. The first pieces I made for this build were my bows! I adore this gorgeous Telio fabric. One of my on-going issues with my builds (and specifically fukus) is that I tend to prioritize commissions and group builds for others over my own stuff, so as a result, a lot of my fukus haven’t turned out exactly how I wanted. This time around, I worked on pieces periodically between commissions and actually did a couple of mock-ups on pieces I’ve had issues with before. To start, I knocked out the satin pieces. I almost always ease into a new fuku by starting with the bows and the collar, and this one was no exception. Victoria Bane drafted a new collar for us over at Cosmic Coterie, and, being the giant that I am, I had to make a few adjustments for it to fit on my frame. I *may* go back and make it a touch wider, but it’s close enough to my desired width that I’m not being too picky about it for now. Mocking-up my collar. I lengthened the tails by about 3″ and used the slash-and-spread method to widen the entire thing by another 1.5″. For this fuku, I lengthened my bodice by 2″ like normal, but I’ve had issues with it pulling in the past. This time, I also added an inch to my bloomers and it fits SO MUCH BETTER. With my last Jupiter, I also cut my hip roll way too small. 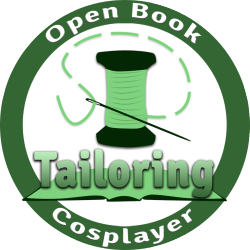 This time, to keep it more proportionate to my sizing, I cut the width at 5″ as opposed to 4″ used in the Coterie tutorial, giving me closer to 1.5″ width on my final hip roll. I like the look a lot better on me. Probably the weirdest part of making classic Uranus and Neptune is their angled glove rolls. I have to give a massive shout-out to Katie Cosplays for her tips on this! She recommended cutting the angles on the true bias, and with some careful finangling, I was able to squeeze upholstery piping into the channels for my gloves. The only thing I’m not really happy with on these is how far they tend to stick out when wearing them. I may hand tack them to my gloves or see about re-making them at some point. Either way, tutorial coming soon! Base boots prior to painting and alterations. To finish this build up, I bought a pair of boots from Sheikh shoes and painted them with a combination of navy and black paints from Angleus leather. The “belts” are scraps of stretch vinyl I had on hand that were a pretty close match. I made faux belts and glued them to the base shoe with Barge. I also resin casted mine and Victoria Bane’s brooches using tips from the amazing Daydreamer Nessa’s tutorial! I need to re-cast these, unfortunately. The size is perfect, but my silicone mold was way to floppy, so the resin settled at the base and created a flat portion. The colors are perfect, though! Also, shout-out to my teammate Victoria Bane for styling my wig so I could finish this costume as well as Belle! Who’s your favorite outer senshi?